The Paris Agreement Is Burning France. Paris is burning. The arsons are protesting against carbon taxes on fuel aimed at defraying for climate change. French "Yellow Vests" are rioting and burning while chanting on the streets "We want Trump!" Do you think such tax hikes and riots would have happened in the US, if Hillary had won the election? I think Russian bots with fake Micronesian Forum accounts are relentlessly spreading lies and disinformation...as they have been doing since 2016. Unfortunately, Forum Admin lets it happen, even while more and more members quit in disgust. PARIS (AP) -- The "yellow vests" in France are worrying greens around the world. The worst riots in Paris in decades were sparked by higher fuel taxes, and French President Emmanuel Macron responded by scrapping them Wednesday. But taxes on fossil fuels are just what international climate negotiators, meeting in Poland this week, say are desperately needed to help wean the world off of fossil fuels and slow climate change. "The events of the last few days in Paris have made me regard the challenges as even greater than I thought earlier," said Stanford University environmental economist Lawrence Goulder, author of the book "Confronting the Climate Challenge." Economists, policymakers and politicians have long said the best way to fight climate change is to put a higher price on the fuels that are causing it — gasoline, diesel, coal and natural gas. Taxing fuels and electricity could help pay for the damage they cause, encourage people to use less, and make it easier for cleaner alternatives and fuel-saving technologies to compete. But it's not so easy for people to think about long-term, global problems when they are struggling to get by. Macron said the higher tax was his way of trying to prevent the end of the world. But the yellow vest protesters turned that around with the slogan: "it's hard to talk about the end of the world while we are talking about the end of the month." The French government quietly fears a Trump-led backlash against the accord could spread to other major economies whose commitment is essential to keeping the deal together. The fuel tax was not originally Macron's idea; it dates back to previous administrations. But he vigorously defended it and won the presidency in part on a promise to fight climate change. Yale University economist William Nordhaus, who won this year's Nobel prize for economics, said the tax was poorly designed and was delivered by the wrong person. "If you want to make energy taxes unpopular, step one is to be an unpopular leader," he said. "Step two is to use gasoline taxes and call them carbon taxes. This is hard enough without adding poor design." Macron, like French presidents before him, made environmental and energy decisions without explaining to the public how important they are and how their lives will change. He's also seen as the "president of the rich" — his first fiscal decision as president was scrapping a wealth tax. So hiking taxes on gasoline and diesel was seen as especially unfair to the working classes in the provinces who need cars to get to work and whose incomes have stagnated for years. The French government already has programs in place to subsidize drivers who trade in older, dirtier cars for cleaner ones, and expanded them in an attempt to head off the protests last month. But for many French, it was too little, too late. "Higher taxes on fuel have always been a policy more popular among economists than among voters," said Greg Mankiw, a Harvard economist and former adviser to President George W. Bush. Even proponents of carbon taxes acknowledge that they can disproportionally hurt low-income people. Energy costs make up a larger portion of their overall expenses, so a fuel price increase eats up more of their paycheck and leaves them with less to spend. And because energy costs are almost impossible to avoid, they feel trapped. It is also not lost on them that it is the rich, unbothered by fuel taxes, who are hardest on the environment because they travel and consume more. "The mistake of the Macron government was not to marry the increase in fuel taxes with other sufficiently compelling initiatives promising to enhance the welfare and incomes of the 'yellow vests,' said Barry Eichengreen, an economist at the University of California, Berkeley. Now the question is "How can we address the climate problem while also avoiding producing political upheaval," Goulder said. The key is giving a good chunk of money back to the people, Wesleyan University environmental economist Gary Yohe said. Many economists back proposals that would tax carbon, but then use that money to offer tax rebates or credits that would benefit lower-income families. "Is it a death knell for the carbon tax or pricing carbon? I don't think so," economist Yohe said. "It is just a call for being a little bit more careful about how you design the damn thing." AP science writer Seth Borenstein reported from Washington. AP economics writer Christopher Rugaber contributed from Washington and Frank Jordans contributed from Katowice, Poland. those who emit greenhouse gases, economists say. But as French President Emmanuel Macron learned over the past three weeks, implementing such taxes can be politically explosive. On Tuesday, France delayed for six months a plan to raise already steep taxes on diesel fuel by 24 cents a gallon and gasoline by about 12 cents a gallon. Macron argued that the taxes were needed to curb climate change by weaning motorists off petroleum products, but violent demonstrations in the streets of Paris and other French cities forced him to backtrack — at least for now. “No tax is worth putting in danger the unity of the nation,” said Prime Minister Édouard Philippe, who was trotted out to announce the concession. It was a setback for the French president, who has been trying to carry the torch of climate action in the wake of the Paris accords of December 2015. “When we talk about the actions of the nation in response to the challenges of climate change, we have to say that we have done little,” he said last week. Macron is hardly alone in his frustration. Leaders in the United States, Canada, Australia and elsewhere have found their carbon pricing efforts running into fierce opposition. But the French reversal was particularly disheartening for climate-policy experts, because it came just as delegates from around the world were gathering in Katowice, Poland, for a major conference designed to advance climate measures. Yes you are indeed correct my fellow russian bot @z . I posted about this same issue a few days ago and i said the same thing that it was about the climate change agreement carbon tax and fuel tax. @FactsMatters didn't call me out because "it" knew i was right. Don't be discourage to post the truth. They will call you a Russian bot at first and then racist comes next and brown Nazi. The Washington post acknowledged that the paris riots are happening because of the carbon taxes from the paris agreement. The Washington post also suffer from Trump Derangement Syndrome like FactsMatters. FM hate to admit that people are rising up against the leftists globalism agenda. Wear that Russian bot title with pride. It shows that you are not liberal drone and you are not a NPCor none playable Character who repeats what the media tells him or her to say. It seems FactsMatter doesn't believe that facts do matter. Micronesia is among the greatest supporters of the Paris climate accord. These facts really do matter so that our people know the effects of their own governments' dealings. They thought taxes could stop carbon emissions and instead cars are set aflame emitting black plumes of carbon emissions higher than the Eiffel Tower. FactsMatter wants these facts censored. Apparently, truth is considered "hate speech" by the left. And they wish to censor all media platforms, like the Nazis did in the 1930's . Its only facts if its agree with the lefts standpoint. But when its against the lefts view its hate and russian bot and bigoted. 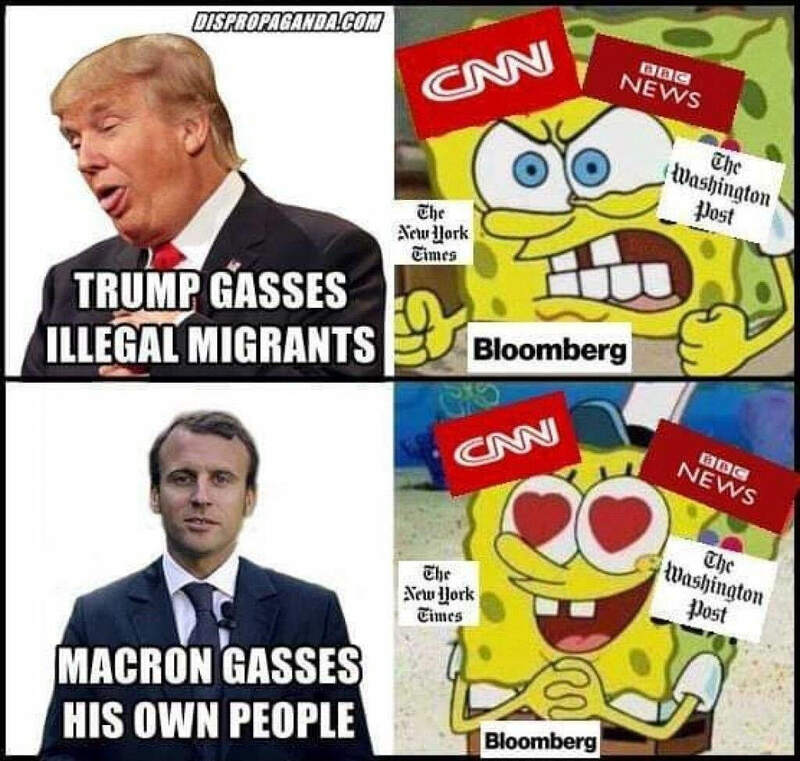 Left's poster boy Macron has approval rating of 18%. Now the yellow jackets are asking for Marcons to resign. Merkel out in Germany now Marcon is about to get the boot in France. 2 liberal anti trumpers kicked out. Yup, the yellow vest protests continues. They brought more policemen and tear gas yesterday. Tommy Robinson's Brexit march also took place this weekend. Mainstream media is trying so hard to hide and spin these uprisings. Fake news for faken ewes. Liberals falling like dominoes all around the world. Paris agreement is making people riots in France. No to liberal agenda. The ongoing nonpartisan protest goes to show that raising taxes will eventually bring about more poverty and discontent from all sides of the political spectrum. The question is why do leftists in America and Micronesia promote big government and free stuff? Don't they know those things require more taxes? Perhaps most islands in Micronesia don't pay taxes, yet they demand free stuff. I wonder where they got their leftist logic. By the way, Merry Christmas to the beneficiaries of Operations Christmas Drop. May your culture live forever. 2020. 1 more year to go for another 4 more year. After makaing America great again we are going to keep America great. 2 terms baby. 8th Consecutive weeks of protests in Paris. The movement has spilled over to other countries. Ongoing bank run to bring down Euros. This happens when poor tax-payers have globalists in power. Globalists put the interests of global institutions above the interests of its own citizens. Post modern democrats are globalists. They would put the interest of illegal aliens and foreign refugees above their own citizens'. The media is downplaying the riots in paris. Their agenda is failing. The progressive agenda will inevitably fail because no country can increase social program benefits for its citizenry while supporting open borders. Like we are witnessing in the EU, the leftist mobs have joined the right-wing protesters because they can no longer cope with the economic conditions with high taxes to feed citizens and the growing number of refugees. Their's will be the fate of the US, if existing laws against sanctuary cities and open borders are not enforced. Hence, the need for the border wall. The only "niggas" here belong to the party that created the KKK.